Shopping for feta cheese can be a little more than confusing. Despite the 2005 ruling by the European Union restricting the use of the name "feta" to Greece, the market is still filled with cheese labeled "feta" from EU member countries like France and Denmark. "Feta" can also be found from Romania, Bulgaria, and the US. For the purpose of this article, we'll talk about Greek feta—that delicious salty cheese made from sheep or goat milk, or a combination of the two. Many of the other "feta" cheeses in the market - and even some Greek "export feta," are made from cow's milk, and the taste falls far short of the original version. Of course, it's delicious and authentic, but it can also be expensive. These imported cheeses can cost anywhere from $7 to $10 per pound when purchased in one pound or smaller quantities, and if you're a fan of feta, the price can be a stumbling block. The solution? Buy in large quantities and store it. Feta is often sold in large quantities and the price can drop dramatically. Most chain supermarkets sell feta in small packages, so if you want larger quantities, look elsewhere. Greek and Middle Eastern markets are one solution, and online shops that sell Greek products is another. Also, try using your favorite search engine to find "feta cheese." Store in brine: Feta is often sold in blocks packed in a brine solution (heavily salted water). It can be kept refrigerated, covered with the brine, for quite a long time. If, during use, the amount of brine decreases, add more. To make a brine, mix one pound of kosher salt with one gallon of water. The salt may not dissolve completely; this is OK.
Store in paper: Barrel-aged feta sold straight from the barrel may be wrapped in a lightweight paper, then in a plastic bag. Keep the feta in the paper, even when it gets soggy from the cheese moisture, and keep both in a plastic bag or plastic wrap. Store in olive oil: This is often called "marinated feta" and, depending on how you plan to use the cheese (great for salads), this may be the solution for at least part of your feta. 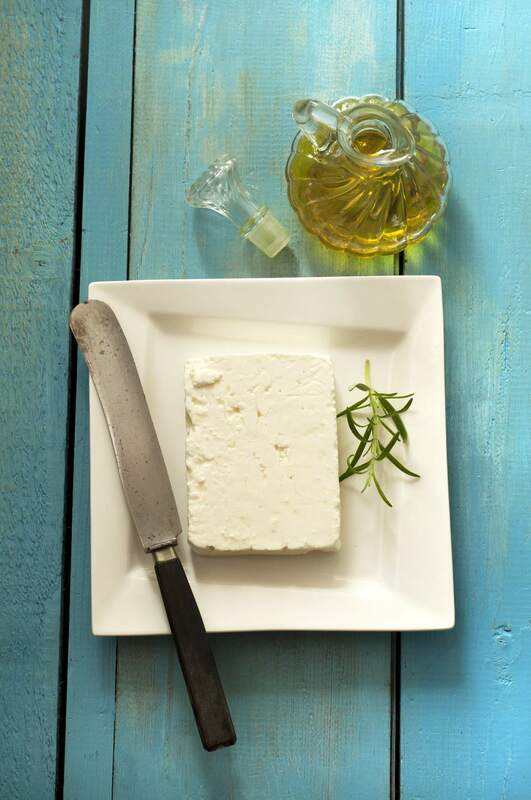 Place chunks of feta in glass jars to 1/2 inch of the top and cover completely with olive oil. Seal tightly and store. Do not refrigerate. Freeze: Feta can be frozen, but the texture will change slightly. After defrosting, use this feta to crumble on salads or in cooked dishes, rather than as slices. Freeze wrapped in airtight plastic packaging; defrost in the refrigerator without removing the wrapping. When defrosted, if not used at once, store in brine or olive oil. If Greek feta is too salty for your taste, take the piece you want to use and soak in a mixture of 1/2 water and 1/2 fresh milk for an hour. Note: Feta should always be protected from exposure to air which will cause it to dry, and will cause the taste to sharpen or sour.